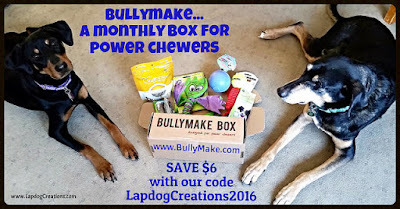 The Lapdogs got their first taste of a Bullymake Box back in August, and really enjoyed the toys and treats. And, they came out with a WIN! 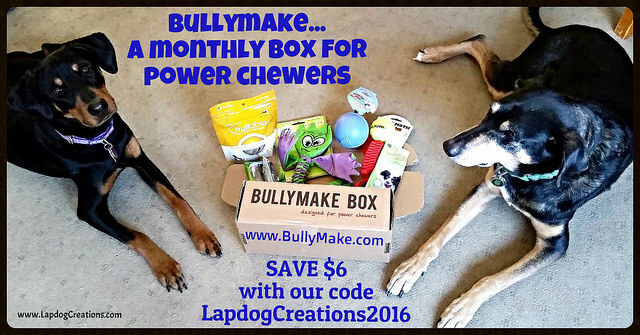 We highly recommended Bullymake Box to anyone with a heavy chewer back then, and we still do today. When the folks over at Bullymake contacted us and asked if we would be willing to review another box, they received an enthusiastic yes! As we mentioned in our first Bullymake Box review, there is nothing fancy about the packaging and they do not include any inserts. Instead, the focus is on stuffing each box full of delicious treats and durable toys. 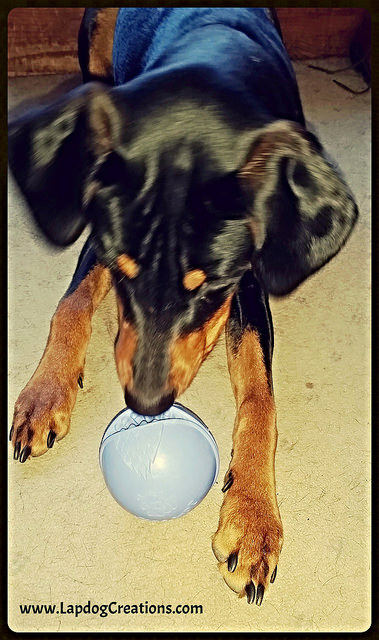 Made from 100% natural rubber, Monster Balls provides hours of fun when stuffed with treats or kibble. The Lapdogs are having a blast chasing it around our living room! 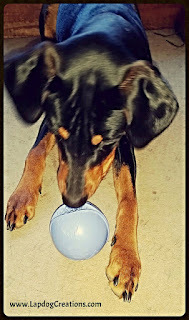 Perfect for dogs who love to shake, toss, tug and squeak until their heart's content. Not only will it keep your dog entertained, they'll entertain you in the process... Penny runs around the house at a gazillion miles an hour, comes to a screeching halt and then shakes, shakes, shakes. Made from durable webbing with a tennis ball attached, this toy is ideal for interactive playtime. There's been a lot of tossing and tugging going on! These tasty little morsels have been a staple in the Lapdog household for years now. We love Fruitables treats (see above), but I'm a little embarrassed to admit I did not know they now produce dental chews. Teutul really enjoyed it. Abrasive ridges on the outside combine with Ark Naturals' patented toothpaste center to make a tasty, yet effective dental chew. This was a new-to-us brand and Sophie gobbled it up with no complaints. 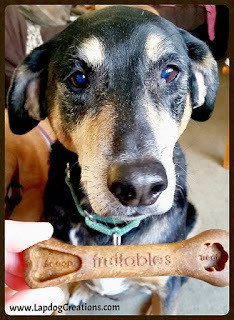 Another new to us dental treat, N-Bones are all natural, low fat and low in calories. Do you think your dog - or dogs - are a great fit for Bullymake Box? Ready to give them a try? What if I told you we've got a coupon code just for you? 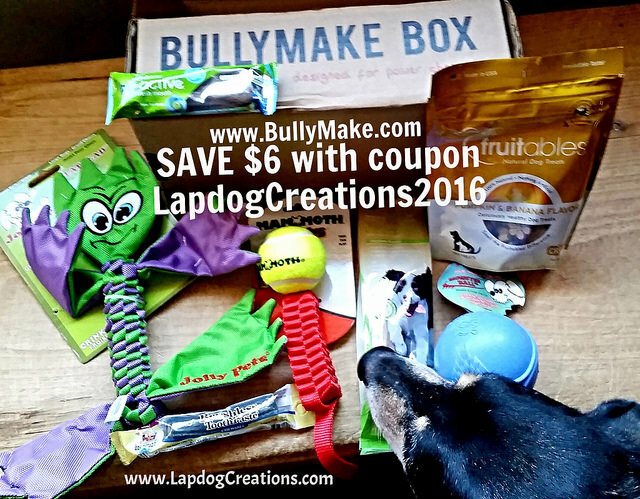 That's right... sign up for Bullymake Box now and use coupon code LapdogCreations2016 and SAVE $6 off any plan purchase! You will also be asked to enter your dog's weight. This ensures the toys and treats will be best suited for your pooch. 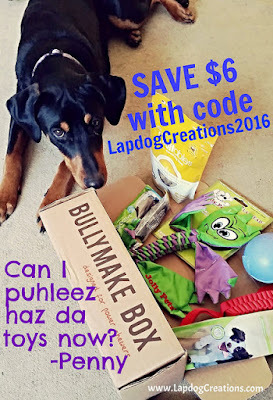 Don't forget to use coupon code LapdogCreations2016 to save $6! It won't be long... Bullymake now ships your first order in just 1 business day! That means you have time to sign up and receive your dog's first box in time for Valentine's Day! What a sweet treat for your special four-legged someone. Teutul, Sophie and Penny think all dogs deserve a Bullymake Box. I think all parents of four-legged destruction muffins deserve a Bullymake Box. That looks like a great assortment of toys. I know you guys have been enjoying Fruitables for a long time; I actually have some for my visiting dogs. That looks like a nice box made for real dogs. I need to check out those treats made with toothpaste. They might save me some time on days when I can't get everyone brushed. I have got to try this box! The Goldens are so bored with their bones! This looks like a fun subscription box! Bentley would LOVE that Flathead with the squeaker!